17 October 2014: Based at the film studios where all eight Harry Potter films were made, the Studio Tour offers visitors the ultimate opportunity to step onto authentic sets, discover the magic behind spellbinding special effects and explore the behind-the-scenes secrets of the Harry Potter film series. The attraction showcases the incredible British talent, imagination and artistry that made the impossible a reality on screen and highlights include walking through the Great Hall where so many famous scenes were shot, seeing the treasures stored in Dumbledore's office and strolling down Diagon Alley. Sarah Roots, Vice President, Warner Bros. Studio Tour London, said: "Since opening just two and a half years ago, we've been overwhelmed by the amount of positive feedback from our visitors. We're delighted that so many of them have taken to TripAdvisor to recommend the Studio Tour to travellers all over the world." Polly Vincent, Senior Partnerships Manager UK & Ireland, TripAdvisor, commented: "TripAdvisor congratulates Warner Bros. Studio Tour London 'The Making of Harry Potter' on reaching 10,000 'Excellent' reviews from our global community of travellers. Since opening, Warner Bros. Studio Tour London has partnered with TripAdvisor to encourage its visitors to write reviews about their experiences. 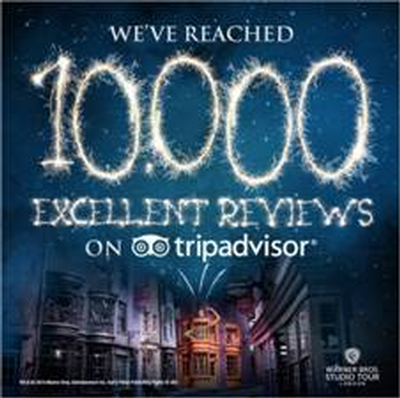 Today's achievement underlines the great success of the attraction's review collection efforts." The Studio Tour is based just 20 miles from central London and tickets must be pre-booked at www.wbstudiotour.co.uk.